As used in various places such as Burger King, Wendys, McDonalds, Albertsons, Tom Thumb, Cub Foods, Trucking Company's, Nascar, Airports, Schools. If you have any Questions regarding any aspect of selecting the proper vinyl strip door kit for your needs, Please use the blue "Ask The Pro" feature button below or feel free to call us at 800-982-6966. We will be happy to assist you. For more sizes (width of strips) Select HERE. How to Order an Ameri-Brand Strip Door Kit. Use the simple 5 Step checklist below, to be sure you will receive the correct product for your needs. Here's Why Our Strip Doors are Better. and, you can SEE the QUALITY. The height of the door opening determines the width and the thickness of the strips. Typically, the taller the door is the thicker the strips need to be and also the taller the door the wider the strips are. 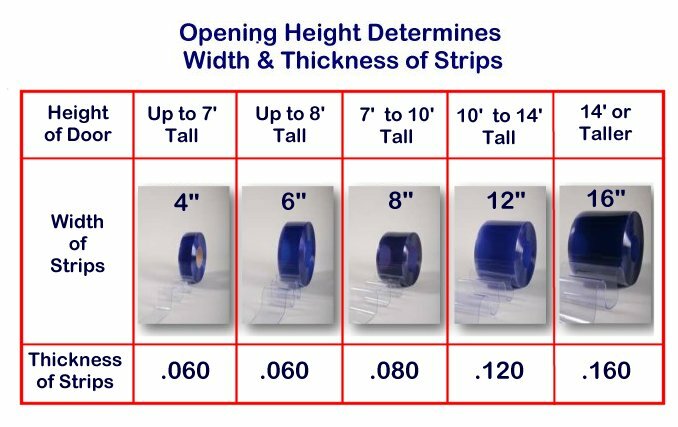 You can use the chart below to determine the proper width and the thickness of strips needed for your application. NOTE: The available door width sizes are shown in the "Dropdown" menus above. Some of the sizes are available in progressive 6" increments. Example widths: 4', 4-6", 5', 5-6", 6', 6-6", etc. Order the exact size you need or round up to the next largest size if your coverage area dictates. 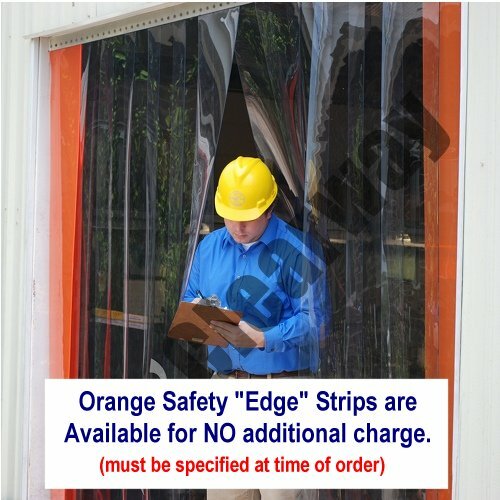 As shown in the strip door installation video, the track is easily cut at the installation site if the size needs to be reduced. Not sure about the proper thickness you need? Here's some more information on Strip Door gauge or thickness. Type 1 = Standard Strips. These are normally used in -10 degrees to +150 degrees farenheight. Type 1 strips are used in most applications including typical walk-in freezers and refridgerators. Type 2 = Low-Temp Strips. Used for EXTREMELY LOW temperatures down to -40 degrees farenheihght. If purchasing the The Type 2 strips, you may want to consider the use of the nylon fiber reinforced panels. This can help to prevent strips from shrinking or elongating in extremely cold conditions. This step determines the strength of the mounting hardware and the durability of the strips. NOTE: The mounting "Pegs" on both the Medium Duty (MD) and Heavy Duty (HD) Mounting Systems are spaced at 2" intervals which is considered the "Industry Standard". This means that any other manufacturers strips will most likely fit our mounting systems. Our Medium Duty (MD) hardware is designed to easily handle medium duty use such as Pedestrian, Pallot Jack, & Push-Cart traffic and can be used on doors up to 12' tall. It's made of an incredibly tough state-of-the-art injection molded polymer and can be used in the coldest environments. Measuring a full 1/4" thick, this track is among the thickest available on the market today. Each piece of track is 2' long and interlocks with the adjoining piece. This makes the installation process extremely easy as there are no long, akward pieces to have to deal with. This is especially helpful (and much more safe) if the installer requires the use of a ladder. If a section less than 2' is required, the size can be easliy adjusted in the field with the use of a hacksaw. The pre-drilled mounting holes are designed to accomodate fasteners up to 3/8" diameter and can be installed as a HEADER mount or JAMB (lintel) mount so there's no need to worry if you've ordered the correct unit. The design of our strip attachment pegs is in'geniously simple. There are no clips, push tabs, locking nuts, or retaining bars to lose or fail. The Heavy Duty (HD) hardware can handle the toughest loads that may be required on any strip door application. Made from HEAVY DUTY Structural Aluminum, this strip door mounting hardware is perfect for use with motorized traffic applications such as forklifts, tractors, and other vehicle traffic. Also, this strip door hardware system should be used on any door that is over 12' tall. Measuring a full 1/4" thick, this track is among the thickest avaialble on the market today. Each piece of track is 2' long and interlocks with the adjoining piece. This makes the installation process extremely easy as there are no long, akward pieces to have to deal with. This is especially helpful (and much more safe) if the installer requires the use of a ladder. If a section less than 2' is required, the size can be easliy adjusted in the field with the use of a hacksaw. The pre-drilled mounting holes are designed to accomodate fasteners up to 3/8" diameter and can be installed as a HEADER mount or JAMB (lintel) mount so there's no need to worry if you've ordered the correct unit. The design of our strip attachment pegs is in'geniously simple. There are no clips, push tabs, locking nuts, or retaining bars to lose or fail. Larger types of traffic (forklifts, tractors, etc.) require more rugged, durable Strips and Hardware. These strips can be ribbed to provide additional stability and longevity. Ribbed strips also maintain clarity longer as the raised ribs take the brunt of the wear and tear when heavy equipment passes thru the door. The strip door mounting hardware is designed to be mounted either directly on the wall / face of the door (wall mount) or on the underside (header mount) of the door opening . If you will be using the Wall mount method you should add at least 2" to both sides of the door opening and 2" to the height of the door opening when ordering your strip door. Example: If your door opening is 5' wide and 7' tall, you would need to order a strip door kit measuring 5' - 4" wide x 7' - 2" Tall. NOTE: The fasteners needed to mount the track are not included with the kits as we do not know what type of mounting surface the kits will be mounted on. NOTE: The Strip overlap relates to the amount of strip that overlaps its neighboring strip(s) and is expressed as a percentage of the amount of overlap one strip will cover the neighboring strip. Pedestrian or "Walk Thru" Traffic - Vinyl strip doors with walk-thru traffic should use smaller size strips with less overlap. A 6" with a 67% overlap or an 8" strip with 50% overlap works well. 4" strips should be used on very small openings (4' wide or less) with walk-thru traffic only. FYI, smaller strips provide less wind resistance and do not hold up as well under heavy forklift traffic. Pallet Jacks and Carts - Pallet Jack and Cart usage usually means that the loads will be larger and that the traffic will be heavier. This type of traffic will usually have a have a person walking with the load. If an you anticipate both the heavy pallet and accompanying personell usage, you may want to use 6" wide strips with a 67% overlap, or 8" wide strips with a 50% overlap. Forklift and Tractor Traffic - This is pretty tough traffic. It will wear more quickly on strip door systems. Use larger strips for this abblication. If the cargo is lightweight, the larger strips may tend to drag or pull product off the pallet. An 8" material with 50% to 100% overlap or 12" material with 25% to 50% overlap. Size of Opening Vs. Size of Load - If the opening is small in relation to the size of the load, you may want to consider using smaller strips with less overlap as the strips are more prone to dragging items off of the load. For example, consider 8" material versus 12" material on a 96" high opening with an 84" high load. Larger vinyl strips and /or more overlap should be consideed for the larger doors or when windy or drafty conditions may be a factor. Very windy or "Negative Air Pressure" applications may require a higher percentage of strip overlap. If you have any Questions regarding any aspect of selecting the proper vinyl strip door kit for your needs, Please use the blue "Ask The Pro" feature button below or feel free to call us at 800-982-6966. Thank you. Q: Do you carry any other colors besides clear? A: Yes, we have welding strips and anti bug strips and the orange side "hazard" strips. Thanks for asking. Click the button below to add the 4" Strip Door Kit (Complete) 4" Wide Strips with Quick-Mount Hardware to your wish list.